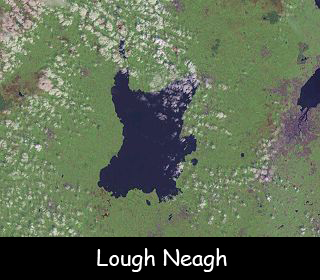 Lough Neagh is located in the center of Northern Ireland. There are six counties (states) in Northern Ireland and five out of the six counties touch its shore. It is the largest freshwater lake in the British Isles with a surface area of 383 square kilometers. It is also the biggest lake in the United Kingdom. The name means the lake of the horse-god Eochu. It has a catchment area of 2,200 square miles.This lake contains over 800 billion gallons of water. It is home to the largest commercial wild eel fishery in Europe. Approximately 400 tonnes are exported in a year to outlets in Billingsgate, Holland and Germany. A total of six major rivers flow into the Lough Neagh, River Bann being the largest and one river flows out of it. The average depth of this lake is 8.9 meters and the maximum depth is 30 meters. It has a shoreline approximately 125 kilometers long. The maximum length of the lake is 30.5 kilometers (South West to North East) and maximum width is 12.1 kilometers (West to East). Lough Neagh is a designated Ramsar site, that means a wetland which is of international conservation importance. It has been estimated by scientists that it was formed in the early Tertiary period when a fault line occurred. It is home to the Maid of Antrim which is one of the oldest passenger vessels in the inland waterways of Northern Ireland. It is the only lake on British islands that a person cannot see the other side. Some archaeological remains have been recovered on Coney Island. Declan, Tobin. " Lough Neagh Fun Facts for Kids ." Easy Science for Kids, Apr 2019. Web. 25 Apr 2019. < https://easyscienceforkids.com/lough-neagh/ >.